This 1922 Hotpoint range, made by the Edison Electric Company is typical of the period. The company was formed by a merger of the Hughes Electric Heating Company, Hotpoint Electric Heating Company and the heating device section of General Electric in 1918, in order to produce products under the Hotpoint brand name. The first range, Model 1, was produced in 1919. The Hughes Company was founded in 1910 by George A. Hughes, who introduced the first "electric cook stove" that year (see another topic). Hughes became the first president of the newly-formed Edison Electric Company in 1918. The Hotpoint Company was formed in 1912, based on the popularity of the "hot point" on an iron marketed in 1905 by Earl Richardson (see another topic). In 1907, the iron formally was marketed as the Hotpoint Iron. 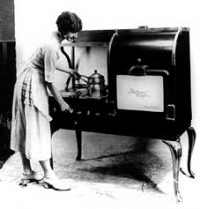 Up until 1922, all electric ranges were in black, brown or both. The Edison Electric Appliance Company model shown here, you will notice, did have a white oven door nameplate, a simple flat porcelain enamel sheet, probably to dramatize the new name. But this year, Edison Electric received an order from a Raleigh, NC utility executive for an all- white, porcelain stove. Rather than admit that such a stove was not being produced, Edison quoted an exorbitantly high price to discourage him. Upon receiving an order anyway, they felt obligated to develop a new annealing process to apply the enamel on the entire stove. Thus it was that 1923 Hotpoint models included all-white ranges with nickel trim on the door, and thereafter, white became widely accepted in the industry for ranges, dominating until the 1960s. In 1931, the Edison Electric Appliance Company became the Edison General Electric Company, and in 1934, General Electric and Hotpoint brand production was integrated, retaining both brand names, by that time, in refrigerators, as well. In 1935, Raymond C. Sandin joined the Hotpoint division of general Electric as a one-man design department. Sandin, born in Sweden, came to US at age 20 and studied architecture at Illinois Institute of Technology before joining Hotpoint. During WW II, he offered a Hotpoint service to help customers plan kitchens, which gathered information valuable in post-war products. In 1944, Hotpoint advertised its "Kitchen of the Future" in Better Homes and Gardens magazine, the result of Sandin's research. By 1965, he headed a Hotpoint staff of 13, out of the total GE design staff of 45 under Arthur BecVar. Sandin remained in charge of design for Hotpoint until his death about 1986.